The location of the evening feast can vary. An easy but expensive way is to book a hall in a restaurant. An another possibility is "TO CHIN" (โต๊ะจีน). It is a table for 12 guests with all food (7 dishes and one dessert). Everything is included in the price. Some workers are coming, dress the table, cook the food and clean everything when the feast is over. More expensive than making everything on his own but useful when time to prepare the feast is short. And last but not the least the couple has to buy drinks such as beer, whisky, soda, ice for beverages and ice creams. It is always safer to think big in case of many guests. 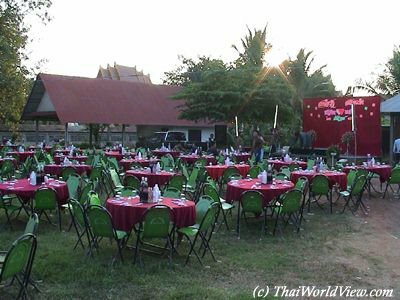 Nobody wants that food or bevarages lack during a Thai wedding. Some large tents shall be rent in case of sudden rains. At the beginning of the evening feast, around 5 p.m, the newly weds go from one table to another. They welcome each guest and thank for his visit with a deep "WAI" (ไหว้ - Thai greeting). Often the guest offers to the groom a glass of beer. The groom shall only taste it if he doesn't want to be drunk. The guest gives an envelope with a bank note. A small gift is given to the guests in order to remind the wedding day. A close friend invites the newly weds to say a few words to the guests, just to thank everybody. Foreigners shall learn a few Thai words!! An "elder" is also invited to say a few words about the couple. This person is usually someone with a high social status, like the groom's big boss, or the village's mayor. Then orchestra can start to play live. People eat, dance, drink and have a lot of fun. The wedding dress can be a white dress but also a traditional Thai dress. During big wedding parties, the newly weds invite Thai Art schools to perform Thai traditional dances. รักนี้ฟ้าลิขิต or "RAK NI FA LIKIT" means a love beyond the sky. For example the sentence is shown during a wedding between a foreigner and a Thai woman. It is like a mystery that people separated by oceans finally married together. In Thai weddings, there are often live orchestra. In Isan area orchestra music is "LUUK THUNG" (ลูกทุ่ง) or "MOLAM" (หมอลำ). Some attractive dancers, a noisy sound system, good food, fresh beer. The feast is a success! Sometimes the neighborhood comes to listen to the music! If the wedding party is a big success, even ambulant shops sell food and drinks to these people. Sometimes for big wedding parties, police is present in order to prevent any disorder due to alcohol abuse. Around midnight, the feast is over. People have to get up early in the morning to work. Sometimes people bring with them an opened bottle. Often young people continue the feast in a karaoke.